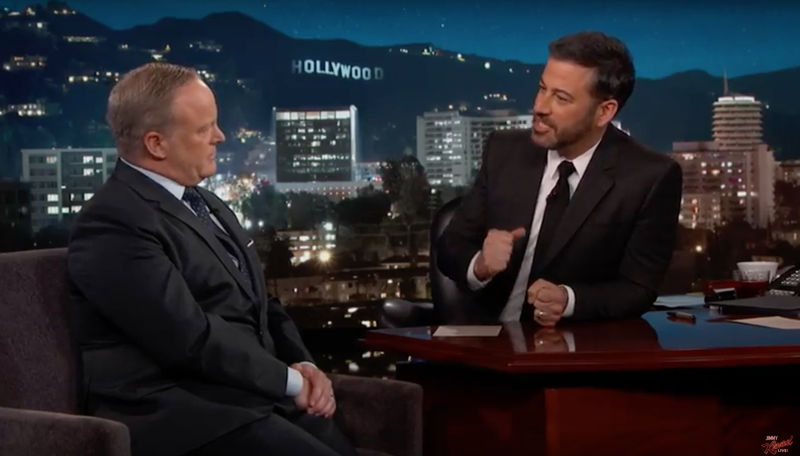 Former press secretary Sean Spicer is having a banner day: first, in the morning Harvard University named him one of their new visiting fellows, then, in the evening, he was on Jimmy Kimmel Live! defending so-called “alternative facts” and President Trump. The interview is rich material for understanding why having Spicer on a comedic talk show—while in theory funny, since from day one in the White House he so obviously played the part of Trump’s eruptive, rapidly tanning pawn—is more disconcerting that humorous. Melissa McCarthy’s Sean Spicer impression was brilliant because through his character she could say anything; the real deal, on the other hand, can still only parrot praise for this administration and caution us all to be more tolerant of it, specifically of the lies it tries passing off as anti-establishment heroics. Thanks, genius, have fun at Harvard.